Letter from NYC: what Monica is missing out on: "Death toll rises as 'flash freeze' paralyzes Northeast"
what Monica is missing out on: "Death toll rises as 'flash freeze' paralyzes Northeast"
A deadly "flash freeze" swept through much of the Northeast on Sunday, causing crashes that killed at least four people and forcing flight delays and closure of all bridges linking Philadelphia and New Jersey. Parts of the Northwest suffered a similar fate: Twelve people were injured in a massive wreck involving more than a dozen tractor-trailers on icy Interstate 84 near Baker City, Ore. But the most pervasive problems were in the East. In Connecticut, Hartford's Bradley International Airport closed temporarily due to ice on the runways. Morning flight delays averaged almost an hour at Philadelphia International Airport; Kennedy International delays were almost 40 minutes. Rain falling on frozen roadways and runways caused black ice and hundreds of crashes across the region. "It has warmed up and we don't have ice now," Charlie Metzger, spokesman for the Pennsylvania Transportation Department, told USA TODAY late Sunday. "We will treat roads again overnight, but we are not expecting a repeat of today's problems." Those problems included three road deaths in Pennsylvania and another in Connecticut. Interstate 76 west of Philadelphia closed in both directions after a 30-car collision that left at least one person dead, Metzger said. 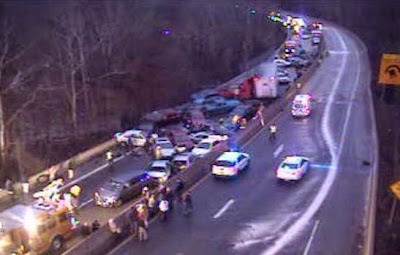 Two people died in a multi-vehicle crash on I-476 in the state. Kaitlyn Maier, of Philadelphia, said she was driving with her boyfriend when she came upon the I-76 crash. "Ten minutes before I was asking him, what is this? Rain, or what?" said Maier, adding that emergency responders directed her and other drivers to turn and drive eastbound on the westbound side to the next exit. "I've driven through snow a lot, and this isn't like anything I've ever driven in. I was going less than 10 mph, but I had no control of my vehicle." In New Jersey, the Pallisades Parkway that links North Jersey to New York City via the George Washington Bridge was closed for hours due to the ice, state transportation spokesman Steve Schapiro told USA TODAY. Speed limits were lowered along the Garden State Parkway and New Jersey Turnpike, where dozens of accidents were reported early Sunday, he said. More than 200 crashes had been reported across the state before the ice gave way to warming temperatures. Schapiro said that in many areas roads were pre-treated, but the rain washed the salt away before freezing. Some roads were treated several times, he said. "We had black ice almost everywhere and roads are treacherous," Schapiro said. The Delaware River Port Authority closed the four bridges linking Philadelphia and New Jersey to allow treatment. Bridges generally freeze before road surfaces do, which can make them even more hazardous. In Connecticut, an 88-year-old woman died in a crash on icy roads, authorities said. And in New York City Fire Department said emergency calls poured in due to accidents on icy roads where traction was limited. The conditions forced road closures in the city and on Long Island. The New York State Thruway was closed southbound from Newburgh to the New York City line. Officials across the region said hundreds of trucks were sent out to treat roads. The situation improved as temperatures rose into the upper 30s and 40s F (4-6 C) later in the day.